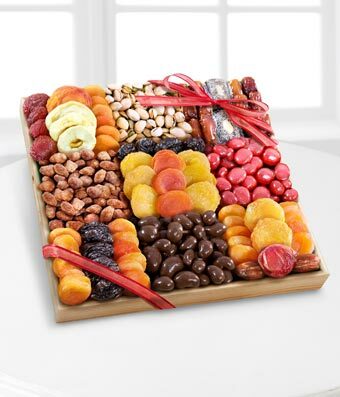 This Premium Dried Fruit, Nuts & Sweets Tray sends your warmest wishes to friends and family throughout the holiday season! A wooden tray with carved handles arrives carrying an array of gourmet goodies. This dried fruit basket is delivered in a basket with a decorative ribbon.